With the advent of spring, there is no better way to start the season than by performing PPC spring cleaning. For this, you need to go back to the account, search all the terms and the lists, and sort out everything that is unnecessary which has been collected for the past few months. In order to succeed in your promotion and to grow your business, occasional clean up of target keywords of PPC campaigns is very necessary. There are other elements of the campaign that also needs cleaning up. After you start, these are some of the items that you need to follow. Begin by cleaning your account structure by analyzing the ad groups and campaigns. Examine the performance and stop any that are either not performing or under-performing in value. This is the most arduous task that you would have to perform, especially if you have a large account. After this, you have to restructure the account and tighten the groups. The keywords have to be organized according to themes, thus keeping them targeted to make sure that each and every ad groups has similar and relevant keywords, so that the ad that is shown matches the keywords that have been used in the search. Users are less likely to convert if they see a difference in between the ad and the things that they are looking for. Keep the best keywords in a separate group. 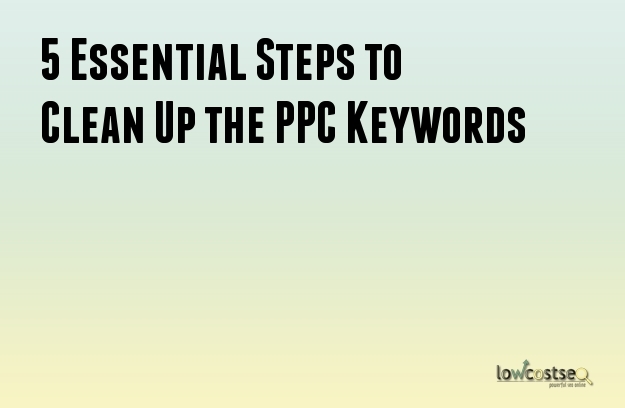 To make sure that the PPC efforts are running evenly, you have to take a look at the different types of keywords and the keywords lists that you have made. Remove the keywords that have become obsolete or are not performing well. After this, remove those keywords that have received the lowest impression or no impression at all. This is because these keywords have an effect on the Quality Score of the ad group and also the campaign in the long run. After eliminating them, test the new keywords and develop them in new ad groups for target purpose. Cleaning the seasonal keywords is necessary for B2C accounts but is also done for B2B accounts. While cleaning up, make sure to halt those which are not applicable to the current season. Also, when you are cleaning the irrelevant keywords, you need to think about the budget allocation and redirect resources. To clean the negative keywords, you have to perform an in-depth search term examination in order to determine the keywords that need to be targeted. Having nailed the keywords that attract visitors that are not your target audience, you have to negative match these both in the ad group level and campaign and account levels. You can also make a list and avoid using these keywords for the new campaign. Duplicate keywords are like burden on the budge. Besides having a negative impact on the quality score, it can also cannibalize the budget. This happens when there are similar words in the same auctions and this makes you compete against yourself. Thus, removing duplicate keywords is very essential.